Freeman was a child with a voracious appetite for both books and food; but, at eleven, she ‘moved from a cheerful, mixed primary school to an academic, un-sisterly, all-girls’ school’. The move from primary to secondary school, she notes with grim perspicacity, not infrequently marks a transition from carefree childhood to pubescent misery, and so it proved for her. At thirteen, there came a day that marked the beginning of a malaise – anorexia – that would last for fifteen years, for two of which she was, not figuratively, starving. Freeman’s descriptions of her illness are harrowing: the ruthless exclusion of all nourishment from her diet, the headaches, the falling hair and fine growth of soft, grey down all over her body, the constant, dreadful chill and the horror of mealtimes ‘when I behaved like a captured animal chained to the table leg, wild with distress’. At the height of her illness, she was put to bed for half a year. With nothing to do but read, she read, starting with the complete works of Dickens. Food, Freeman noticed, is a potent indicator of character in Dickens. ‘Subdue your appetites, my dears, and you’ve conquered human nature,’ urges the terrible schoolmaster Wackford Squeers, stuffing his mouth with beef and toast while his five schoolboy charges share a single mug of watered milk. If wickedness is signified by food withheld, goodness is expressed in terms of meals generously shared: haystacks of hot buttered toast, jorums of tea. Freeman took the contrast to heart: she might be unable to stomach one of Dickens’s hearty feasts, ‘but just reading about them... was beginning to slacken the knots of my illness’. From Dickens to Siegfried Sassoon: hunting teas of cocoa and eggs, cricket teas of veal-and-ham pie, cherry tart and ginger beer, hot tea drunk gratefully in freezing trenches as shells whistled overhead: ‘this was food as friend not foe’. Laurie Lee’s Cider with Rosie and Patrick Leigh Fermor’s A Time of Gifts transformed Freeman’s idea of hunger from haggard accomplice of self-denial to companionable appetite. Freeman, herself a habitual walker, marvels at the ‘swooning, insatiate, invincible’ appetites of these two young men on their glorious tramps across pre-war Europe. Freeman is very conscious that the overwhelming majority of the books that helped guide her through the crisis of her illness are by, or about, men. Two of the three women authors she discusses at length, – Elizabeth David and M F K Fisher – were professional food writers. A Room of One’s Own, comparing luncheon in a men’s Oxbridge college – ‘soles, sunk in a deep dish [beneath] a counterpane of the whitest cream... partridges, many and various’ with the ‘plain gravy soup... sprouts curled and yellowed...prunes and custard’ on which women subsisted. Freeman’s gentle tone becomes fierce when she describes the dismal cult of ‘clean eating’, to which she temporarily succumbed: ‘What had once existed only in my unhappy mind – disgust for food – was now bodied forth... in books and newspapers, on restaurant menus and in shopping baskets.’ The obsession withered when she overheard a young woman in a café ordering cheese on toast with vegan-soy cheese and gluten-free bread. ‘A trembling, frit way of eating,’ Freeman concluded, boldly ordering boiled eggs and buttered soldiers. The ‘cure’ in the title of Freeman’s elegant and courageous memoir is too emphatic a statement. 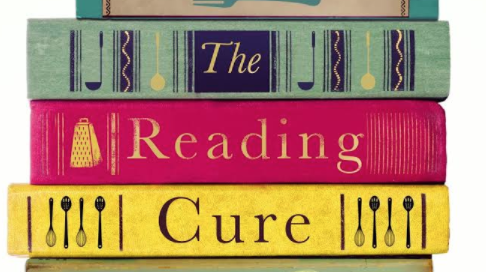 Reading did not banish her anorexia, but it offered a low door in the wall through which she could first examine, and then cautiously join, a world where food was a friend, not a foe.